People are pissed that Jeremy Clarkson has been suspended from Top Gear and the rest of the season has been cancelled. Apparently they're so pissed that they're driving a tank to the BBC. This is a real thing that just happened. This is all part of the change.org petition that is meant to show support of Jeremy and has garnered one million signatures. 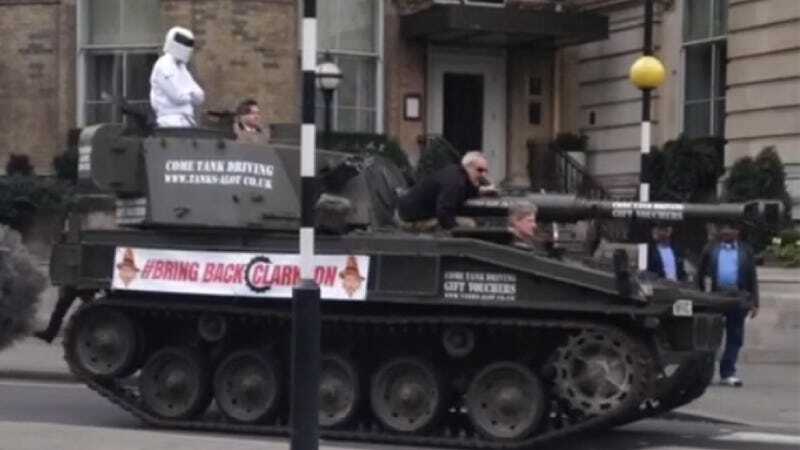 The tank was used to transport the petition to the BBC to reinstate Clarkson from the no meal 'fracas' that got the host suspended last week. Of course, the petition almost definitely won't do anything to sway the BBC. The BBC knows Clarkson and Top Gear are popular, that's why they've employed him for so long despite being so controversial. It depends on the actual truth of what happened to producer Oisin Tymon, not what one million people on the internet think. But driving a tank to the BBC? That sounds exactly like something Clarkson would do. Way to capture the spirit.